If you're looking for a KVM switch then you already know the struggles of having to perform tasks on separate computers through out your day. 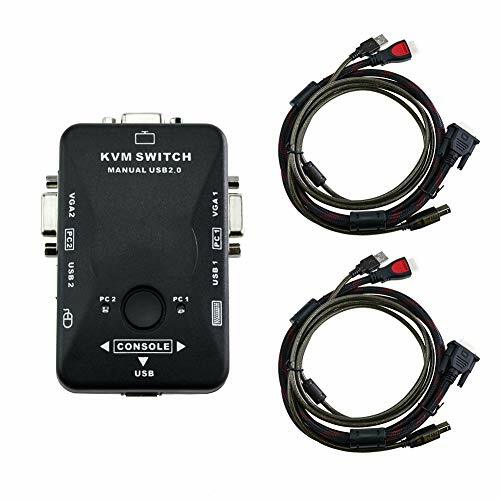 Make life a little easier with our KVM switch. This device will allow you to control 2 computers from the same keyboard and mouse at the push of a button. You will be working, studying, playing or tinkering more efficiently in no time! ◆1 set of USB mouse/keyboard, display control 2 computer. ◆Without external power supply, the host server automatically assigned, plug and play. ◆Automatic identification display resolution, portable design, can be placed on the table. ◆Support DOS, Win3. X,Win95/98/98SE/2000/ME/XP/Win7/Win8, Win NT, Net ware, Unix, Linux and other operating systems. (2) Output interface: 1 road VGA 15 HDF /USB A(female) output. At the same time, We provide 30 days of unsatisfactory return service.100% SATISFACTION GUARANTEE. KVM SWITCH WITH USB 2.0 PORT - Standard USB2.0 interface, support USB wireless device. 2 PORT USB KVM SWITCH -- Allows you to connect 2 computers to one single monitor, with the KVM switch box + one set of key board and mouse, you can switch between/operate 4 computers on one monitor. EASY TO INSTALL - Switches installation is sample, don't need to install any additional software, you can connect to your computer device directly using a cable. CONVENIENT TO USE - Without external power supply, the host server automatically assigned, plug and play. WIDE COMPATIBILITY - Support DOS, Win3. X, Win95/98/98SE/2000/ME/XP/Win7/Win8, WinNT, Netware, Unix, Linux and other operating systems.